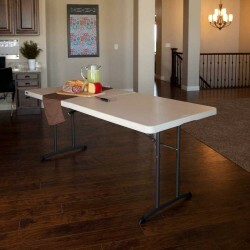 Our Lifetime fold-in-half tables are great for home residential use as well as commercial use at schools, churches, hotels and much more! Free Shipping on all orders! 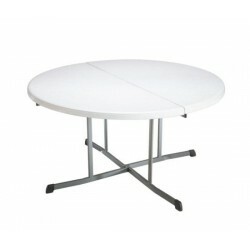 Lifetime 5-Foot Light Commercial Fold-In-Half Table - Features a 60" x 28" molded tabletop (pearl) with a round folding frame (bronze). 2-year limited warranty.FREE Fast Shipping! 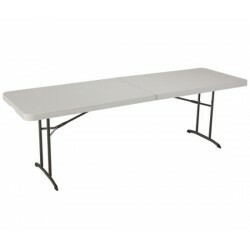 With Lifetime's fold-in-half tables, you get a 6 ft. table that requires only 3 ft of storage space. 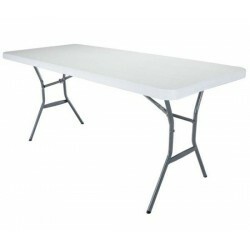 Constructed with a durable, stain-resistant polyethylene plastic tabletop with a powder-coated steel frame for indoor/outdoor use. Available in single pack and 14 pack. Features convenient carry handle. FREE Fast Shipping! 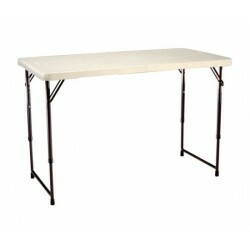 Lifetime 5-Foot Fold-In-Half Table/Bench Combo - The Lifetime Table and Bench combo features a pearl 72" x 30" molded fold-in-half table (80335) with a bronze round folding frame, and two 5' (153 cm) Fold-In-Half Benches in pearl (80503) constructed of high-density polyethylene (HDPE) and powder-coated steel. 2-year limited warranty. FREE Fast Shipping! 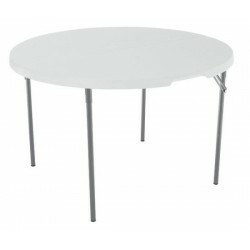 Store 4 ft round tables in just 2 ft of space with innovative fold-in-half tables from Lifetime Products. Designed with convenient carrying handle. 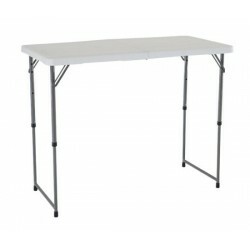 Folding up to only 2.5 ft long and designed with a conveneint carrying handle, you can take Lifetime's 5ft fold-in-half tables anywhere . 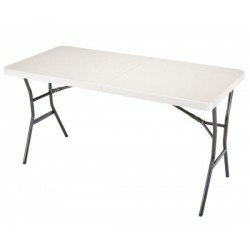 Perfect for craft shows and home demonstrations. 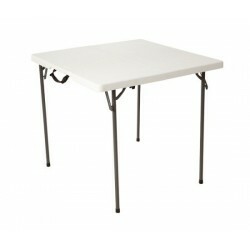 Constructed with a heavy-duty polyethylene plastic tabletop and sturdy steel frame. 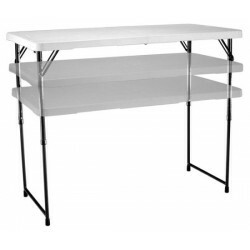 This portable 4 ft adjustable height craft table from Lifetime Products gives you the option of three different height settings for a variety of different craft projects. 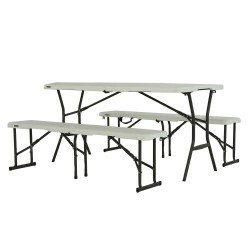 Constructed with a heavy-duty plastic tabletop and sturdy steel frame for indoor or outdoor use. Designed with a convenient built-in carry handle. 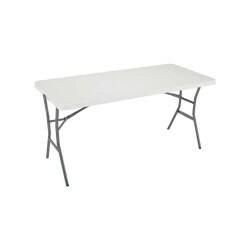 Raise it, Lower it, Fold it up — The Lifetime 4 ft. adjustable fold-in-half table is constructed of durable polyethylene plastic with a steel frame. Even designed with a convenient carry handle.